Carpet comes in three basic styles: cut pile, loop pile and cut & loop pile. Whether you are looking for tough and durable or that lovely plush feeling underfoot, carpet gives you that extra comfort and safety your family deserves. Sit back and let us narrow it down in our quick and informative guide to the style you'll love for years to come! Saxony - You probably had it “wall to wall” growing up. Saxony (known as plush) tends to wear much faster than other styles. It’s probably best used in those low foot-traffic rooms — like that formal living room that Mom saved for “special-company". Saxony is probably what comes to mind when someone think's of carpet —thousands of perfectly even, solid colored strands of fiber standing at attention like a freshly cut lawn. This is the carpet that’s soft and thick and shows vacuum lines and footprints . Textured Saxony - If you don’t need that “freshly mown” look, then Textured is for you. Textured is twisted differently than Saxony and is also steamed to make a permanent curl. This carpet is “trackless” and won’t show footprints because it reduces light reflexibilty. 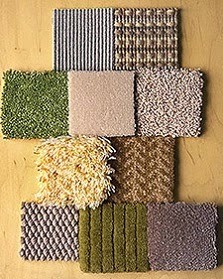 Textured carpet is cool, casual, and it will show far less wear than the other styles. Frieze - More of a Knobby texture, this cut pile offers a tighter “twist” than Textured style. The yarn actually curls over, creating a very durable and elegant product that hides vacuum lines and footprints. Cable - Made with thicker and longer yarns than it's cut pile companions, Cable is comfortable beautiful, and a very luxurious choice. However, it can crush and matte with heavy foot traffic, so we don’t recommend Cable for heavy routes or busy areas of your home. This is how all carpet actually begins — looped and uncut. Often known as commercial carpet, loop pile carpets can either be consistent surface, smooth , or low and high loops giving the carpet a more textured appearance. Loop carpets are usually made from nylon or olefin fibers. Multi-color loop pile comes from combining different colored fibers together which helps hide soiling and traffic patterns. Made from yarns that are looped into the backing, this popular style is perfect for high traffic areas of the home and can be found in many commercial settings.